There is so much more to being physically fit than just getting cardio or strength training. 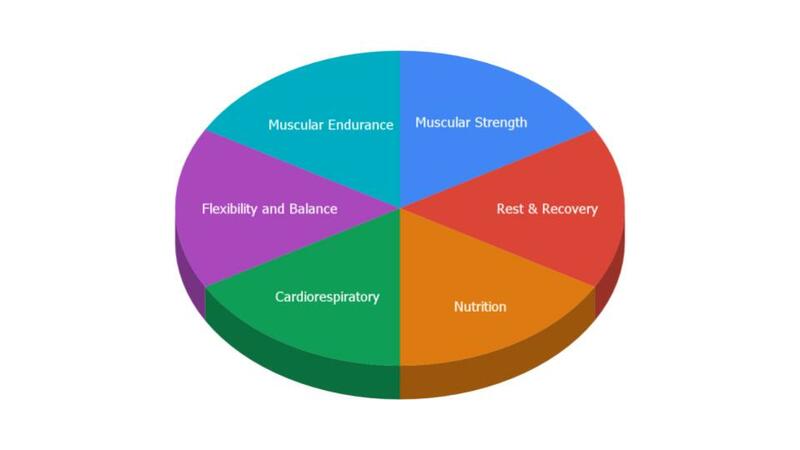 Are you familiar with all the components of physical fitness? More importantly, are you incorporating them all into your life on a regular basis? This is the category that you are likely most familiar with. Cardiorespiratory fitness refers to the ability of the circulatory and respiratory systems to supply oxygen to skeletal muscles during sustained physical activity. That means we are working both our heart and lungs, enabling them both to be more efficient. There are many benefits of cardiorespiratory fitness. It can reduce the risk of heart disease, lung cancer, type 2 diabetes, stroke, and other diseases, and increases feelings of wellbeing. The American College of Sports Medicine recommends aerobic exercise 3–5 times per week for 30–60 minutes per session, at a moderate intensity. You are also likely familiar with what this means; how MUCH weight a muscle can pull, push or lift. How heavy of a box can you lift when you’re moving? When properly performed, strength training can provide significant functional benefits and improvement in overall health and well-being, including improved joint function, reduced potential for injury, increased bone density, increased metabolism, and improved lipoprotein lipid profiles, including elevated HDL (“good”) cholesterol. Muscular strength training should be done at least 2 days per week. This means how LONG can your muscles perform the work that is being asked of them. Think stamina. How long can you lift boxes when you’re moving before you need to take a break? The benefits of endurance training are extremely practical in our daily lives and allow us to do more for longer periods of time. There is an endurance component to most forms of exercise when done for at least 30-60 minutes or more, but focused muscular endurance training is harder to find. Flexibility is needed to perform everyday activities with relative ease; getting out of bed, lifting children, sweeping the floor, etc. Balance keeps tripping and falling at bay. Both tend to deteriorate with age, often due to a sedentary lifestyle. Without adequate flexibility and balance, daily activities become more difficult to perform, and the risk of injury increases. Both are wonderful additions to any workout and can easily be done at any time, any where, for any length of time. More frequent shorter bursts of flexibility and balance training are just as if not more effective than infrequent longer workouts. This is an often overlooked category to physical fitness, but it’s at least as important as working out. If you’re interested in losing weight, watching your diet will lead to significantly faster and better results than increasing the amount or intensity of your workouts. Even if your weight isn’t your primary concern, improving the quality of your diet can drastically change how you look and feel. Another overlooked component to physical fitness, I wrote in depth about the importance of rest and recovery last week on my blog! Click here for a refresher.